Krounchasana/Heron Pose is an intense forward bend pose which also comes in the Intermediate series of Ashtanga Vinyasa Yoga. 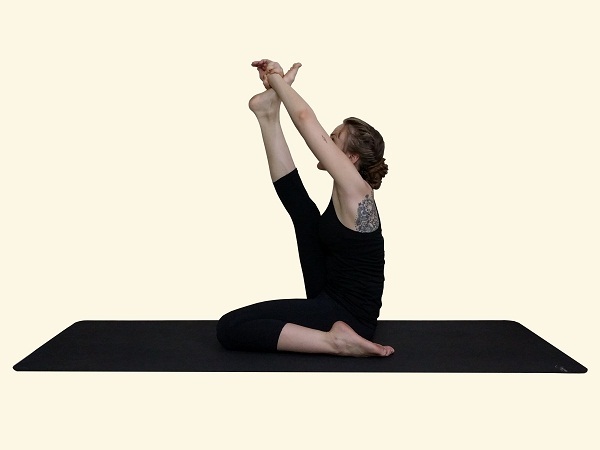 This can be a difficult pose for beginners so practice Virasana to prepare for this posture. Bend your left leg and place the left foot near the left hips with the toes pointing back (just like Virasana ). Make sure both the hips are on the ground, if not then place a folded blanket or a block under your right hips so that the hips are leveled. Bend your right knee and hold the right foot (ankle, shin bone or thigh depending on your flexibility ), now try to straighten the right knee. Keep your spine straight and chest open. If possible bind your left wrist with the right hand. Try to bring your chin towards the shin bone. Use a strap if you cannot reach your foot. You can also hold your ankle calves or thigh depending on your flexibility. Keeping both the hips leveled is important in this posture so place a block or a folded blanket under your hips if they are not leveled.